A Complete the questions with one word only. A few common expressions are enough for most telephone conversations. Practice these telephone expressions by completing the following dialogues using the words listed below. A phrase or sentence built by (tiresome) repetition of the same words or sounds. A Read the text again quickly and complete sentences 1-6. A) Complete each gap with missing phrase from the box below. Абдразакова Е.Н., Гаркуша Н.А. Step up Иностранный язык (английский). Учебно-методическое пособие по английскому языку для студентов естественнонаучных специальностей и направлений. Тюмень: Издательство Тюменского государственного университета, 2010. – 82 с.
Рекомендовано к изданию кафедрой иностранных языков естественных факультетов. Утверждено проректором по учебной работе Тюменского государственного университета. © Е.Н. Абдразакова, Н.А. Гаркуша, 2010. Настоящее учебно-методическое пособие предназначено для студентов 1 курса естественнонаучных специальностей и направлений. Пособие ориентировано на студентов, не изучавших ранее английский язык. Данная разработка рекомендуется для аудиторной и самостоятельной работы студентов. Целью пособия является формирование у студентов базовых грамматических и речевых навыков. Пособие состоит из четырех разделов, включающих в себя грамматический и лексический материал. В пособии рассмотрены следующие лексические темы: «О себе», «Мой день», «Путешествия», «Образование, наука и технологии». Грамматический материал представлен следующими темами: спряжение глаголов to be / to have, образование множественного числа существительных, числительное, местоимение, структура there be, а так же рассмотрена группа настоящих времен (Simple, Continuous, Perfect) и прошедшее время Past Simple. Каждый раздел включает в себя несколько текстов по теме и грамматический минимум, в который входят таблицы, представляющие материал и упражнения. Упражнения составлены с учетом текущей лексической темы, что позволяет лучше закрепить отрабатываемый материал. Темы представлены в зависимости от степени сложности в соответствии с требованиями учебно-методического комплекса, рабочей учебной программой для студентов естественнонаучных специальностей и направлений начинающих изучать английский язык. При отборе материала соблюдались принципы, отвечающие современным требованиям методики обучения иностранным языкам: мотивация, коммуникативность и интегрированный подход. Classical ['klæsɪk(ə)l], piano [pɪ'ænəu], Mathematics [‚mæθ(ə)'mætɪks], student ['stju:dənt], address [ə'dres], sport [spɔ:t], hobby ['hɔbɪ], Physics ['fɪzɪks]. My name is Helen. My surname is Pavlova. I’m seventeen. I study at the university. I am a first-year student of Tyumen State University. My address is 11 Profsoyusnaya Street. My phone number is three-seven-double five-nine-eight (37-55-98). I live with my family, that is, my father, my mother and my eleven-year-old sister Masha. My father is a programmer and my mother is a housewife. Masha is a schoolgirl. We have a dog and, like many people, a cat. I like all kinds of sport. My favorite hobby is swimming; I go to the swimming pool three times a week. I enjoy watching TV and I’m also fond of reading and cycling. I like listening to classical music very much. I can play the piano. My favourite lessons are Mathematics, Physics and English. 1. What is Helen’s surname? 3. Where does she live? What’s her address? 4. What is Helen’s telephone number? 5. What does Helen’s mother do? 6. What does Helen’s father do? 7. What is her sister’s name? 8. What music does Helena like? 9. What is Helena’s favorite hobby? - Hello! My name is Simon, and what is your name? - Hello, Simon, my name is Masha Smirnova. What is your surname? - My surname is Sokolov. How old are you, Masha? I am seventeen years old. - I am seventeen years old too. Where do you live? - I live in Permyakova Street, and where do you live, Masha? - I live in the centre of the city in Lenin Street. Do you like to listen to the music, Simon? - Yes, I do. I like to listen to classical music, but sometimes I listen to rock music. - Oh, that is nice! Well, the lesson starts, let’s go to the classroom. Example:He is a student. – Он (есть) студент. They were students. – Они были студентами. We will be students. – Мы будем студентами. Example: I am here (my friend, parents, Masha). 1. I am late (he, you, they). 2. He is good at languages (you, Mary, I). I am Russian (we, Kate, he). 3. I am fond of music (my friend, my parents, you). 4. I am a first-year student (he, you, my sister). 5. We are at home (my cat, I, my brothers). 6. My father is busy (teachers, I, a boy). 7. We are proud of our University (I, she, my parents). 8. I am happy (she, you, they). 9. I am tired (my mother, you, girls). 10. She is cold (you, I, my dog). Example: I am in Tyumen (a year ago). I was in Tyumen a year ago. 1. My friend is fond of reading and cycling (some years ago). 2. They are pleased with their travelling (last summer). 3. Our teacher is always busy (yesterday). 4. I am good at mathematics (when I was at school). 5. The girl is afraid of darkness (when she was a child). 6. My friends are school-leavers (two years ago). 7. Her mother is a teacher (some years ago). 8. My father is a programmer (five years ago). 9. My sister is afraid of mice (when she was a little girl). 10. You are on duty today (yesterday). Example: I am in Tyumen (in a week). I will be in Tyumen in a week. 1. I am free (in a day or two). 2. She is a student (next year). 3. We are busy (on Monday). 4. Our dean is at his office (in ten minutes). 5. We are at home (at three o’clock). 6. Our new building is very nice (in a year). 7. She is busy (tomorrow). 8. The English students are here (next week). 9. His work is well-done (tomorrow). 10. My brother is in London (in some days). 1. Я – студент(-ка) первого курса. В прошлом году я был(а) школьницей (-ком). 2. Я – из маленького городка. В Тюмени я буду арендовать квартиру. 3. Мои родители – учителя. 4. Мой отец всегда очень занят. 5. Моей сестре – двенадцать лет. Она очень хорошая ученица. 6. Я увлекаюсь музыкой и спортом. Моя сестра увлекается поп-музыкой. Она не интересуется классической музыкой. 7. Мне хорошо дается математика, а моя сестра способна к языкам, но ей не дается математика. 8. Мои родители сейчас дома. Вчера их не было. 9. Я никогда не опаздываю на занятия и не буду этого делать. 10. Я собираюсь стать математиком (физиком, химиком, биологом, географом). Example: She is not a doctor. – Она не доктор. Is she a reporter? – Она журналист? It won’t be difficult. – Это не будет сложным. Will it be interesting? – Это будет интересно? 1. My sister … … at home tomorrow because she will be at her friends’. 2. … you … at school next week? 3. … your father at work yesterday? 4. My brother … ill last week but now he … … ill. 5. Where … your mother now? – She is in the kitchen. 6. Where … you yesterday? – I was at the cinema. 7. Where … your books now? – They are in my bag. 8. … he … in Tyumen the day after tomorrow? 9. What … your surname? 10. How old … you, Masha? - I am seventeen years old. 1. Ты будешь дома завтра? 2. Она была вчера в Университете? 3. Моя мама вчера не была на работе. 4. Мне не нравится езда на велосипеде. 5. Сколько тебе лет, Вася? 6. Как твоя фамилия, мальчик? 7. Ваш преподаватель иностранного языка дружелюбный и великодушный? 8. Я уже не студент первого курса. 9. Меня не будет завтра на занятиях. 10. Нашего декана завтра не будет в офисе. Example:I have a brother. – У меня есть брат. I haven’t a cat. – У меня нет кошки. She has blue eyes. – У нее голубые глаза. He has not a book. – У него нет книги. 1. They like animals. They … … three dogs and two cats. 2. They … … a very nice flat in Tyumen because they live in Surgut. 3. His mother is a housewife and she … a lot of work to do about the house. 4. Sarah … … a car. She goes everywhere by bicycle. 5. I can’t open the door. I … … a key. 6. Quick! Hurry! We … … much time. 7. I’m not going to work today. I … … a bad cold. 8. «What’s wrong?» «I … … something in my eye». 9. Julia wants to go on holiday but she … … any money. 10. Ben doesn’t read much. He … … many books at home. 1. Yesterday we … … an English lesson because our teacher was ill. 2. They … … a test on Physics last week. 3. Alice went to the dentist because she … … a toothache. 4. I … a dog and a cat in my childhood. 5. It was a nice house but it … … a garden. 6. I … a lot of money last month. 7. I … a lot of free time last summer. 8. Charles wasn’t happy. He … a lot of problems. 9. We … modern computers in our classroom at Tyumen State University. 10. Julia wanted to go to the concert but she … … a ticket. 11. I ... many swimming trainings last year. 1. His father … a farm in the North of England because he is a rich man. 2. I … a lot of problems with my exams if I study properly. 3. Next year I … many friends at the university. 4. Tomorrow my family … a lot of work to do about the house. 5. My modern flat … a kitchen, a sitting room, two bedrooms, a bathroom and a balcony. 6. I … my free time on Sunday because I’m going to visit my relatives. 7. My mother … breakfast at six o’clock tomorrow. 8. My brother … a shower after me in 15 minutes. 9. I … a new TV-set only next year. 10. My friends and I … a cup of tea in the evening. 11. The students of TSU ... practical classes because the professor is on the scientific conference. 12. I ... a lot of home work in English tomorrow. 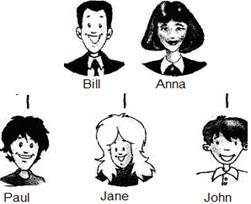 Present Simple Have S (I, we, they, you) got? Has S (he, she,it) got …? Do S have…? Does S (he,she,it) have ? Past Simple HadS got… ? Did S have… ? Future Simple ______ Will S have…? Example: Haveyou gotany questions? / Do you have any questions? – У вас есть какие-либо вопросы? Hadshe gotthe keys? / Didshe havethe keys? – У нее были ключи? Will you have time tomorrow? – У вас будет завтра время? Example: Have you got any brothers or sisters? 1. … she … a family of her own? 2. How many children … your parents …? 3. … students of our groups … many English classes a week? 4. … our teacher … much paper on the desk? 5. … your friend … many good books at home? 6. … Tyumen … any historical places? 7. … your boy-friend … an English-Russian dictionary? 8. … he … many relatives in this town? 9. … we … a math lesson in the time-table? 10. … our University … any computer classrooms for students?